Above the signature picture, what I'll do here is bring you up to speed with what has happened and what is happening. We have Graham Robson on board, ladies and gentlemen. Fantastic news because being a motoring journalist, we now have the day recorded through publications after the event. It traps this historical day when Capri met Ford for the very last time. Graham is also going MC for the day and we will have a PA / marquee down on the test track with the Capris. We will then have personalities, past and present, along with Capri owners with special stories, to bring us all of the interest during the era when this model promised so much. Steve Saxty is also on board people. Steve has been immense. rattling cages and shaking trees. This will give us our ticket into the whole Special Vehicle Engineering team that he envisions drawing on now. This will be brilliant because with Graham as MC, we will be getting into the root of Capri production, R&D. This is shaping into a wonderful day. I have now been in preliminary discussions with Jeremy Walton. He needs to prioritise, so cannot commit at this stage. But he is keeping me posted. Cars - we have some corner stones of the Capri development through the years. Some real rarities we have been looking at. But there are also some others that we are really interested in. This event is starting to shape very very nicely. I would encourage you to watch the following Youtube clip. You may have seen this one before, but if you look through it now, the significance of what we are about to unfold will be striking – VERY STRIKING! Even though the first units commenced being produced from November 1968, the Ford Capri was an instant hit when it was unveiled to the world press on Tuesday 21 January, 1969 in the Beethovenhalle in Bonn. Friday 24 January, 1969, the Brussels International Motor Show is recognised to be the first public viewing of the Capri. It was the start of purchase orders being taken for the official launch in February 1969 of what was to become the most successful European coupé Ford have sold and arguably, the most successful coupé ever in Europe, with 1,886,647 units sold. “The new Ford Capri is the kind of car you’ve probably been hoping someone would make ever since you first put foot to clutch pedal. A genuine fastback. That doesn’t cost a fortune. Handles like a sports car. And holds 4 people”. However, by the mid 1980s, changing consumer purchasing patterns into hot-hatchbacks was placing the old coupé in the shade. The final Brooklands Capri 280 model left the production line on 19th December 1986, with the “bye-bye, Capri” banner on the roof (1,038th unit of these limited production run and almost 1.9mil produced units in total). Since then, Ford have only placed very limited interest in the Capri, only talking about the model that was in the past and is no more. There has never been a specific Ford event to celebrate its most successful coupé. 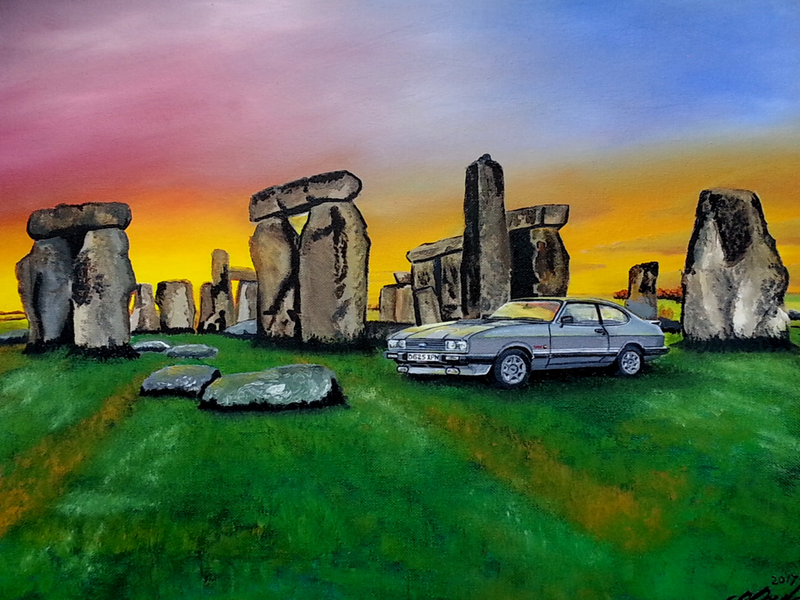 Ford and the Capri are back!! Back in big style! 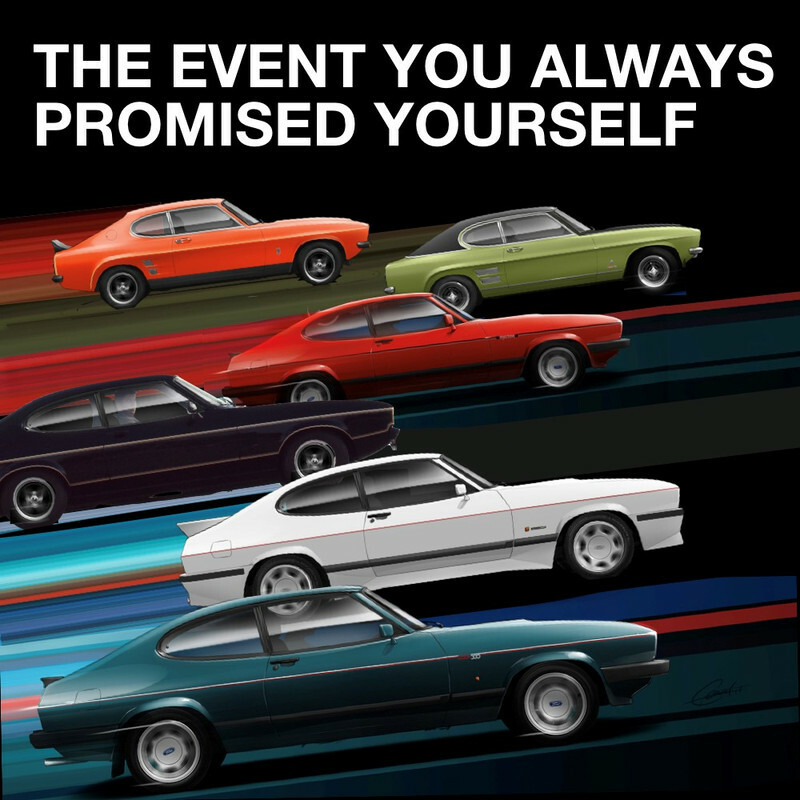 This really is the event you promised yourself for over 30 years and Ford, with St Francis Hospice, are reaching out to you, Capri Owner, to come back and present your car. This seriously is an event you need to be at!!! Last edited by Daz-RSK on Sat Feb 09, 2019 2:47 pm, edited 7 times in total. Today, January 21, 2019, is 50 years to the day when the 1st European Ford Coupé, the Capri, was born when it was shown to the press in the West Germany capital city, Bonn, for the first time. It was sporting, it was revolutionary and it set the world alight. Given the significance of this, Ford have willingly offered their grounds for a classic car show that will be hinged around the Capri and Capri owners for the 1st time ever. This will be held at the Ford Technical Centre (formerly Ford Research and Engineering Centre) in Dunton, Basildon, Essex on 1st September 2019, where that Top Gear / Sue Baker footage was taken. There has never been a specific Capri event hosted by Ford in the past! Not only will there be Capri’s in attendance, but a host of other modern and classic car clubs from Ford will be there. Also a number of classic models from other brands will be present, as part of the main show, a full on classic car festival under the heading of Frankie’s Classic Car Fest, which has been running for 8 years. There will also be facilities, vintage market, food stalls, a stage, a disco, a live band, fun for the family, fun for the kids. This will be an epic day. As Capri Owners, we have the spotlight. We will collect on the famous Dunton Test Track where that iconic footage was taken, showing one of the last of a long line of Capri units being produced and interviews with key Ford personnel at the time explaining the rationale for deleting the model. We will be parked on the track that the R&D was completed on our models. Please make this a day to remember to show everyone that the passion remains, even if the production has not. The Ford Heritage Capri’s will be in attendance – all of them – it is hoped. Steve Saxty, creator and author of the book “The Cars You Always Promised Yourself” is hoping to be in attendance. He might be able to drive along in one of the Ford Heritage Capri’s. Steve will also be able to sell & autograph his books and it is hoped that he might be able to complete either a small presentation of the book or maybe complete and question & answer session about it. This is to be confirmed and organised. More details will follow. It is also hoped that Rod Mansfield, the chief engineer of performance Ford models of the 1970/80s, including the Capri, will be able to attend. Also, Steve Burton of Burton Power will hopefully be there in attendance on the day. We are looking to invite big Ford motorsport / motor tuning companies and Classic Car / Classic Ford publications with a hope of an article written about the day, using Ford and St Francis Hospice contacts and knowledge. Stay tuned to this as we hopefully unfold and confirm more big names to this event. I will update this thread in chronological order but any key changes, please look to these opening 2 posts as the key source of information. Just to note, that there are a couple of events that are running in close proximity to each other. This Dunton event on 1st September 2019 and the Brooklands event on the 8th September 2019. As organisers of the Dunton event, we would encourage you reserve yourself for both. YOU HAVE GOT ME INTERESTED – WHERE DO I SIGN / HOW DO I SHOW MY CAR / HOW MUCH DOES IT COST ETC? Pre-booking is essential to be part of this historic event and this will close on August 17, 2019. You can also book by phone on 01708 771404 (the St Francis Hospice events line), if online booking is not convenient, and a downloadable form to apply by post will be available shortly. The entry fee per car is £10, although there is an Early Bird offer if you apply before 30th April, which reduces this to £8. This will get you plus any passengers (no entry fee per person apart from public entry) into this great location, which is not normally open to the general public. In addition, all pre-booked entrants will get a free goody bag on the day as part of their entry. All of the funds raised go directly towards patient care in the local community through Saint Francis Hospice services, and over £125,000 has been raised from the previous shows. The show is open to the public from 10.00 until 16.00 and display cars need to be on site between 8.30 and 9.30 that day. You can either enter as an individual, or as part of a Capri or other club – just put the club name in the entry details (there is a box for this). We regret that no dogs (other than assistance dogs) are allowed on site by Ford. So who's now interested ? It would be useful for the forum members here to place their names down, just so we know who is interested and how many. I would suggest placing your name down when you have bought your entrance ticket. Through the ticket sales, we will have an understanding as to how many Capri's / who is interested. But you may want to park together as a group and, therefore, making yourself known on here is one way you can reach that aim. I will be reaching out to all of the regional Capri Clubs and will be placing an article in the Capri Club International. We have already seen significant enthusiasm from the E Anglia Capri Club and no doubt there will be more. There is unlikely to ever be a Capri event in the future that Ford will hold and host for you. This will most likely be the only and the last time. It's taken 30+ years to get something like this together and that's from people within the Ford Motor Company who remember this icon. I have just turned 50 myself in the last week, therefore, the Capri means a lot to me in a number of ways, one of those being that we are the same age. In years and decades to come, the Ford employee base will change and these cars will be resigned to historic motors that Ford once sold, with no real passion for what they meant and little memory of what they stood for. Please keep the spirit alive for this one, the probable one and only time that Ford will open up its hallowed turf to you. Thank you. Will let you know looks like one not to miss . It makes it back to back weekends with Brooklands(! ), but I am going to consolidate all my car-show visits this year into hitting these two in September and then that'll be it. Fantastic this has now been confirmed, but I'm torn! One part of me wants to attend, however there is so much organisation with Brooklands to do I'm not sure if I really can take the time or the money to get over to Dunton from where I am. I may have to miss it for that reason, but I'll make a decision soon. 2litreScapri wrote: Fantastic this has now been confirmed, but I'm torn! One part of me wants to attend, however there is so much organisation with Brooklands to do I'm not sure if I really can take the time or the money to get over to Dunton from where I am. I may have to miss it for that reason, but I'll make a decision soon. Thanks for the interest and comments people. You all have to make up your own minds on this one. I can only sell this event as much as I can. You’ve got to take the plunge where you see fit. But before you do that, just hold it in the balance for the moment. I recognise the challenge of this being consecutive Sundays. May I just make some observations in case you have overlooked. If it is the 2 consecutive weekends that concerns you because of time proximity between the events, I can’t do much about that one, I am afraid. That unfortunately is how it falls out. But if it is cost, mileage, time consumed to get to the events, there is nothing that can be done there, whether the events were 1 week apart, 1 month apart or 4 months apart. If you wanted to attend both, you would need to make that effort twice. But don't think one was going to be a free ride if it was positioned in another month. I guess, it sounds more consuming when placed together than separated. The bonus I point to – you only need to tax your car in September and get 2 shows for the price of one month, if you SORN it most of the year! Naturally, given the work behind this Dunton event (Kris knows what I am talking about with the associated work behind Brooklands event), I will support this event as much as I can as I need to stay close to it and hope people are interested in this. BUT we recognise the Brooklands event as an epic event. In fact, the Frankie's Classic Car Fest organiser for this Dunton event - my compatriot - is thinking about attending the Brooklands as well. At this stage, I will definitely be at both events, weather permitting (see below). I will embrace the lot and will be at the Bomber event as well. There is only one year that the Capri is 50 years old, in my view. -	The risk that one is plagued with one of our summer washouts and that's the event you have chosen. What then ? As organiser of the Dunton event, if this happened on 1st Sept, I would have to put up with this. Not because the turn out will be smaller (I am philosophical about that one). It's more that I am compelled to bring mine out in the flipping rain, given my responsibility. I would then look forward to the hopeful blue sky Brooklands day. I am sorry, but soaking weather will have to stop me going to Brooklands because I have no responsibility there. And I know a number of Capri owners who won’t take their cars out in the wet. I think the issue though will be the frustration as you see blue sky pictures in one and showers on the other (the one you attended). So I would hedge your bets here, book both, recognising one might be a complete soaker. -	They both bring a different element to the Capri owner - one is a purist (solely Capris) on more public land, where the other is more generalist on purist (private) land. -	Brooklands & Kris brings the familiarity of a great event, the pure Capri event, the Brooklands name, the Brooklands grounds, that historic place, the well established “you know what you get…and you reminisce of the good times and well organised shows of the past!!! !” Dunton cannot bring you this. -	Dunton brings different things – we have the freedom to ask who we want to attend, big names, big publications, famous people, people who can have the stage, who can trade, who can demonstrate, engineers who can talk about their motors they designed. Ford manufactured our cars! Best will in the world, Brooklands is not getting anywhere near this. -	2 events that give you such a diversity – how can you miss either ??? -	Finally, once done, that will be it. This will be the only Ford event for our cars. I won't be about at Ford on the next big one and believe me, no one else is following me in Ford to jump on this bandwagon. You can't just turn up at Dunton and wander around for £10. It is private land and sensitive land at that. You can’t park where we will be parking on that famous track. It is forbidden. You can’t get to see some of the other items on show, like this, ever again. 2 epic events together where in future years, there will only be one (if Kris continues the good work). I can't compel people to go to both - I can only encourage. It's your choice. But look what you are throwing away if you choose one over the other. 50th birthday events come only once - that's both for Brooklands and Ford Dunton events. Kris will know his appetite and Brooklands appetite what further Brooklands events are on the horizon for Capri. This Ford one is a one off, believe me! Once done, no more Capri's will be entering this R&D test track. At the end of 1st Sept, the last Capri departs the track it was tested on forever. A piece of history is made there and then! Seriously consider that! But if still uncertain or rejecting this, please wait – wait until you see what we unfold here. I can’t promise anything now but don’t throw this event out as it stands – throw it out in 6 months when we have not been able to deliver what you want. I would just see what unfolds in the 1st posts here on this event before you throw it in the bin. There was a thread on here about 4 or 5 years ago asking what Ford are doing about this car and its birthday ? People then responded that nothing was happening - because Ford are not interested, it won’t happen, nothing is being done, people with empty promises etc. I am proud that I have met your requests and that was half of my battle - a big battle. During that battle, I even got told I could have 20 Capris turn up perched at the back of the show that Ford have during a weekday in June to celebrate the 50th birthday, that's how much of a battle I had. I have got the interest from Ford to deliver and answered your plea from 4/5 years ago. For me only, that is a success on its own. But please also see it like this - Sept 2nd, it's over, it's done - finished!. You'll never be placed on the Ford track, in your car, that tested the R&D of your motor ever in your lifetime. How much of a life sacrifice is that worth ? Only you can call that in terms of how important Capri and Ford are to you. Take your time - make your own minds up. £8 til end of April, £10 til mid August. There is no rush and watch how this all unfolds. I think it would be hasty to call one and not the other at this time - better to do both! Go on do both, Kent to Essex or Kent to Brooklands is no distance. I have just heard that we have now beaten the 50 Capris marker entering into this event. We are now at 57 Capris parked on the track! This is fantastic people. In just 8 weeks since I announced it as well! I am really pleased we got to 50. My hope is for 100. So we have not got far to get there. Thank you to all of you on this forum who have supported this by entering! It really is appreciated by me! !